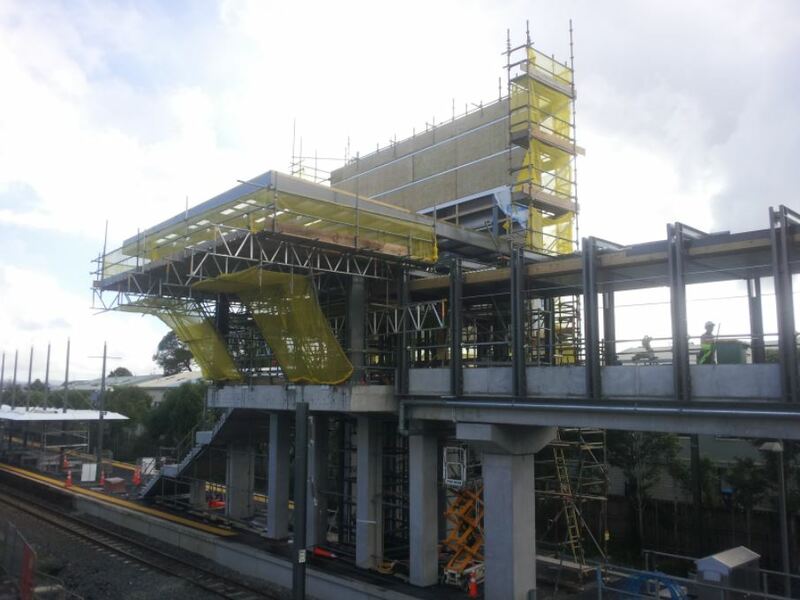 Over the last number of months, a lot of work has been going on at Mt Albert to upgrade the station. It is the final station on the Western line that is left to be upgraded and was previously one of the worst on the network having consisted of just some fairly basic school bus shelters, although they were at least an improvement on the concrete block shelter that existed at the station a few years prior to that. Here is what the station looked like just a few years ago thanks to the former AKT site. Here is what Auckland Transport envisage the station will eventually look like. With the upgrade in full swing, I popped along to the station to see how it was progressing. I didn’t bother with shots on the station itself as the shelters are the same as found elsewhere on the network. Things are looking good and a vast improvement on what existed before. I really like how the station building acts almost like a flag, telling people that there is train station at that location. I’m sure that the locals who use the station are eagerly looking forward to the reopening of the connection to Carrington Rd. Speaking of connections, wouldn’t this car park make for a perfect little public plaza, connected to the station by a new bridge? Looking good. Now, if only the owners of nearby commercial premises would clean up their properties. Using that carpark as the entrance to the station have been in plans for a long time – but we’re yet to see any action on that. 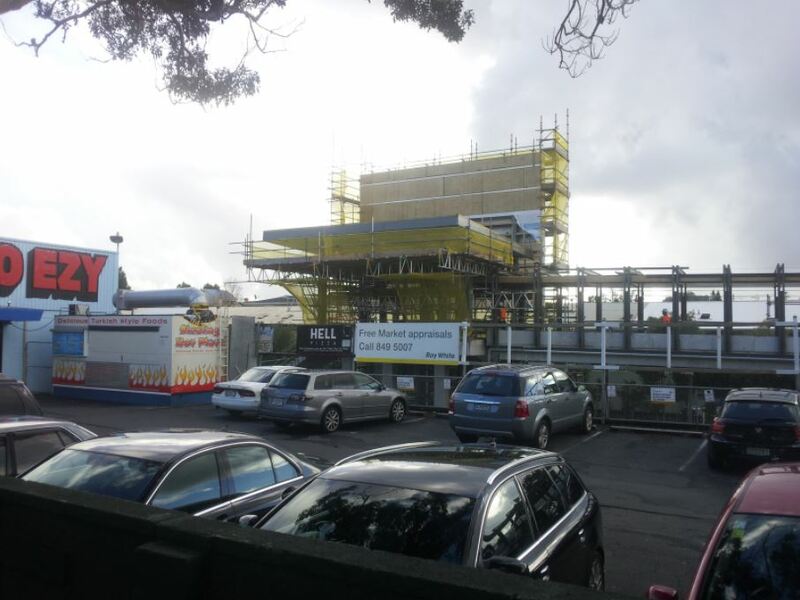 Very happy with the progress at Mt Albert. However, I’ve noticed that the canopies installed at other other stations have become yellow with age. I wonder if there is a flaw in the paint used? It isnt a good look. Even worse: Jacobs Ladder Bridge. The ‘transparent’ sides are quickly yellowing from the bottom up. Blech. Unfortunately, although structures using glass or transparent plastic look great to begin with, they almost always just get more and more dirty until they look worse than any plain structure could ever look. 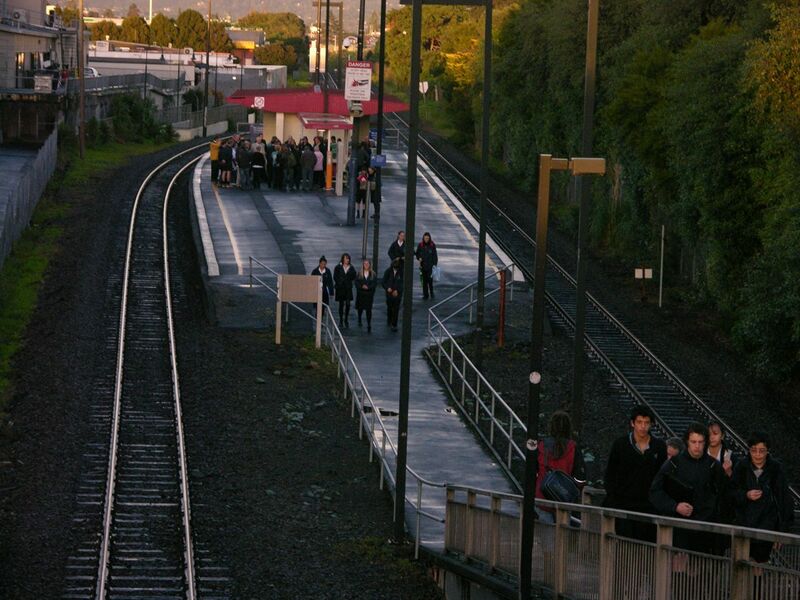 At a Mt Albert Train station meeting the public could attend some months ago did some heavy hinting that more access provisions had already been included in the design – but due to ongoing land purchase talks, they were forbidden from saying any more. So my guess is that there WILL eventually be a link that doesn’t depend on the narrow Carrington Road footpath anymore. The large central platform will be tailor-made for that. Yep I had heard that too, I have also heard what the hold up was but won’t say anything as don’t want to jeopardise anything. Well based on all former plans this was to be the carpark outside VideoEzy, I think the original issues were lack of funding, and then the slowdown from what I have read have been issues with the owners in purchasing the land, I don’t think they can purchase it compulsorily so have to negotiate and I was of the understanding that the owner was demanding an excessive amount for the land – I know what I’d rather have in front of my shop if given the option of the entrance to an increasingly busy train station or a dozen carparks. In the plan above from AT you can even see that that carpark has suddenly become a public square, just without the connect, so it’s pretty clear what their intention is. Lost opportunity for rail bus interchange on the Carrington Road overbridge which is odd given that Outer Link buses cross it. I realise there are budgetary constraints, but surely this is one of those situations where network pragmatics outweigh short term fiscal ‘prudence’ in order to enable a critical node point for effective modal transfers? Is it a lost opportunity, or just one that hasn’t been done yet. I mean does anything in the design stop that being done in the future? A bus interchange there would be a tall order – since in Auckland it is still usually impossible to do anything that would slow down cars, you’d have to widen the bridge at least one lane each side AND widen the footpaths (can’t use the existing car lanes!). So a bus interchange there is extremely expensive. That said, a good interchange would be perfectly feasible using NNR, so not really needed. Having to walk 15m more to the train station is not an issue. The times they are a-changin’! Yes a bus interchange is feasible, and necessary on NNR, for NNR buses. 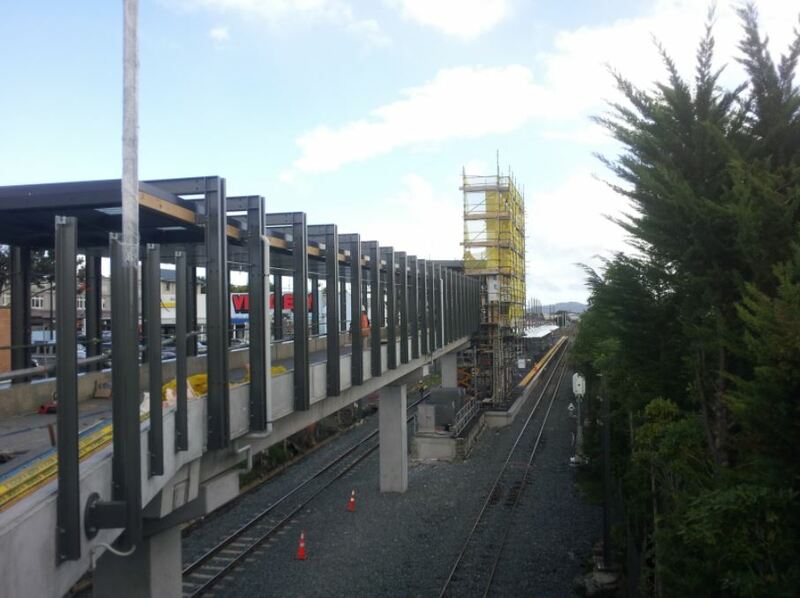 But there will be something needed for Carrington Rd – Mt Albert Rd buses too. The nearest existing stops are 100m down Mt Albert Rd, on the other side of NNR, or 200m up Carrington Rd. Not very good for accessing the station, and particularly poor for bus to bus connections. It would be fairly simple to widen the footpath at the stop locations, so otherwise it is just a case of having a bus stop on the kerbside lane, so yes a case of reducing car priority for once. What’s so hard about canterlevering a footpath extension of a bridge? A lot easier than widening the bridge itself. I like the all weather access, there are a few more stations that could benefit with a similar design. Not altogether sheltered access to the platform canopies given that the slow part of the access, ie the stair, is open to the elements. Hopefully AT will eventually realise this is a major disincentive and will emulate what they’ve done at New Lynn by installing a cover. Maybe at the same time they install the New North Road access point. They really need to offer a way for pedestrians to cross New North Rd outside the western entrance. Almost everyone using the station is coming on foot, but the nearest crossing is a long way in either direction across what is a busy and dangerous road. Does anyone know if this is in the plans? 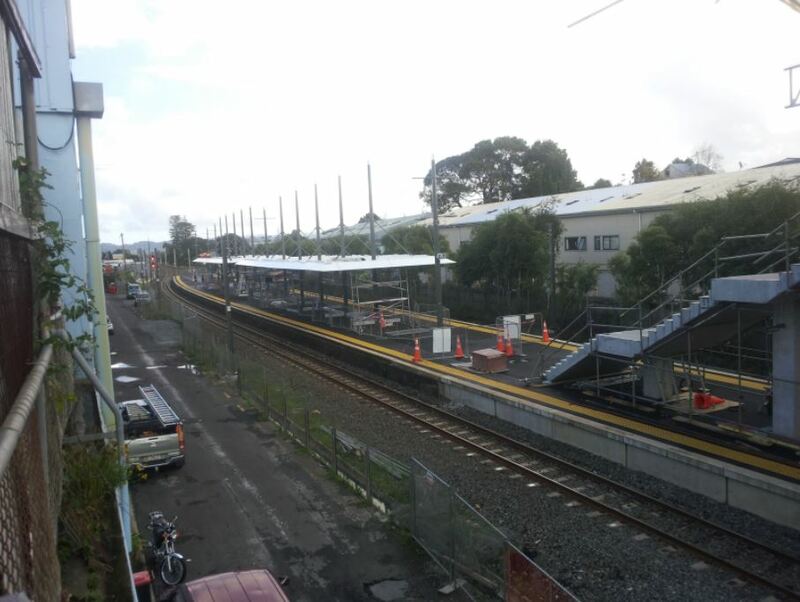 It’s really nice to see these new stations on the Western line going up. I think that leaves only Westfield, Te Mahia, and Takanini as being especially grotty – the last two still have their brick shelters, although Takanini’s one is crumbling. Puhinui’s shelter is strange and smells, too, though. Westfield might not be worth bothering with if it’s going to close in a few years anyway. Can anyone explain why they’ve built that long pedestrian bridge rather than going straight down from Carrington Rd and moving the platforms closer? Will walls be built along the side of the pedestrian ‘bridge’ linking the station with Carrington Road, or will the sides be left open? Thanks for this update, Matt. Do you or anyone know if there will be any covered bike parking provided for this station upgrade? i’d love to see this provided as an integral part of all PT upgrade, but it’s proving difficult to get AT to see that bikes and PT are good mates. I’m not aware of any. Bike parking never seems to be at the forefront of designers minds when it comes to train stations. Bike parking was not in the designs they showed during the public meeting – and short of providing it on the high-level platform itself, there’s very little space for it. All the approach routes are very narrow, barely wide enough for the pedestrian streams they already have. Hopefully, bike parking will get added once that mythical plaza access is provided.